Queens Removals proudly offers home and office removals in Walton-on-Thames at low cost without compromising on service. Whether you're moving from a studio flat or a mansion, our experts will assess your requirements. We'll provide you with a free, no-obligation quotation. Queens Removals employ specialist removals men to take care of your piano, fine art and antiques. The KT12 postcode district lies within or includes part of the following towns, counties, localities, electoral wards and stations: Hersham, Hersham North, Hersham South, Oatlands Park, Shepperton Town, St George's Hill, Surrey, Walton Ambleside, Walton Central, Walton North, Walton South, Walton-On-Thames, Weybridge North, Whiteley Village. KT12 is located just under 20 miles southwest of Central London. The population is around 35,000. Nearly 30 per cent of the people in KT12 are educated to degree level. The most expensive places to live in KT12 have homes worth around £2.5 million on average. A few of these expensive streets are Kings Drive, Manor House Drive and Broadwater Road South. Streets with very affordable properties include Weylands Close, Somerset Close, and Pankhurst Road. In areas such as this, houses can be bought for around £150,000. Walton-on-Thames is a town on the River Thames in the Elmbridge borough of Surrey. An outlying suburb of London. 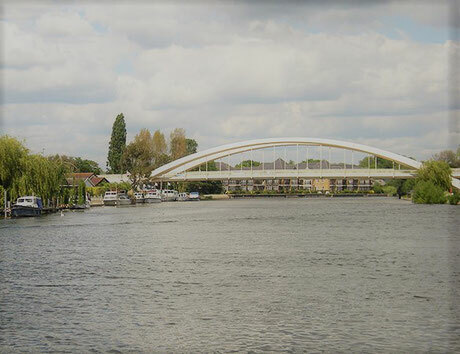 Its waterside has the Thames Path National Trail between Sunbury Lock and Shepperton Lock. Its own localities include Ashley Park and Field Common. Its station on the South West Main Line has proven important to its development – its services run with a minimum of one stop before London Waterloo station. The town is divided into four wards and is a local hub in terms of retail and services.